Mr. Nijay Kumar Gupta has over 35 years of experience in PSU, Private Sector, Foreign Banks and MNC corporate in India and overseas, advises exporters, importers and Foreign Currency borrowers on above matters. 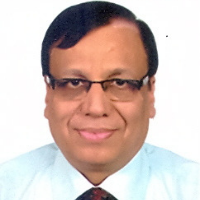 Mr.Nijay Kumar Gupta has trained a lot of Top Management and employees of +200 Corporates, Banks in India/Overseas and is also a Visiting Faculty at NMIMS, BSE, Chetna’s and DSMIS etc. In his 35 year career with various Indian and Overseas Banks, he was Head of Treasury and was responsible for creating values and profit in Integrated Treasury with Forex, Money Market, Treasury Bills, Govt. Securities/Bonds and Asset Liability Management for banks and also setting up the Corporate Treasuries for managing their International Forex Exposures, Hedging/MTM strategies with International Trade Finance activities.